Movie review: Adaptation of Ransom Riggs’ popular young-adult novel deviates from the book in some places. Rating: 3 stars out of 4. An ethereal-looking blond girl, in a sky-blue dress with a rope tethered around her waist, delicately steps out of her ornate, heavy shoes — and, just like that, soars like a balloon. She’s not quite flying, not quite floating; it’s more like she belongs to the air, like a contented kite. This is just one of many gorgeous moments in Tim Burton’s “Miss Peregrine’s Home for Peculiar Children,” a thoroughly enjoyable movie that’s nonetheless going to be a hard sell. Devoted fans of Ransom Riggs’ popular young-adult novel might be disappointed by the film’s many swervings from the book (starting with, but not restricted to, the identity of that flying girl). Younger kids, drawn to the fantasy element and the children in the cast, might be frightened by some of the film’s creepier sequences — one of which certainly had me wanting to look away. Conversely, fans of the director might find it all too Tim-Burton-Meets-the-X-Men for their taste. ‘Miss Peregrine’s Home for Peculiar Children,’ with Eva Green, Asa Butterfield, Samuel L. Jackson, Chris O’Dowd, Allison Janney, Judi Dench, Terence Stamp, Ella Purnell, Rupert Everett. Directed by Tim Burton, from a screenplay by Jane Goldman, based on the book by Ransom Riggs. 122 minutes. Rated PG-13 for intense sequences of fantasy action/violence and peril. Several theaters. The time-travel element gets awfully twisty, perhaps a little too much so. But there’s great pleasure to be had in the performances, particularly Green’s deliciously avian Miss Peregrine (both her suit and her hair seem to be sprouting wings) and the cackling good time Samuel L. Jackson is having as a shape-shifting, pointy-toothed villain. Rupert Everett and Judi Dench are a welcome sight in small roles. As with every Burton film, the fun’s in the details: an abrupt cut from the elaborate opening credits to an almost hilariously bland street; a beautiful 3D moment of raindrops seeming to be showering over us; the spin Jackson puts on the line “have you ever been to Florida?”; a flower, picturesquely crumbling into dust. 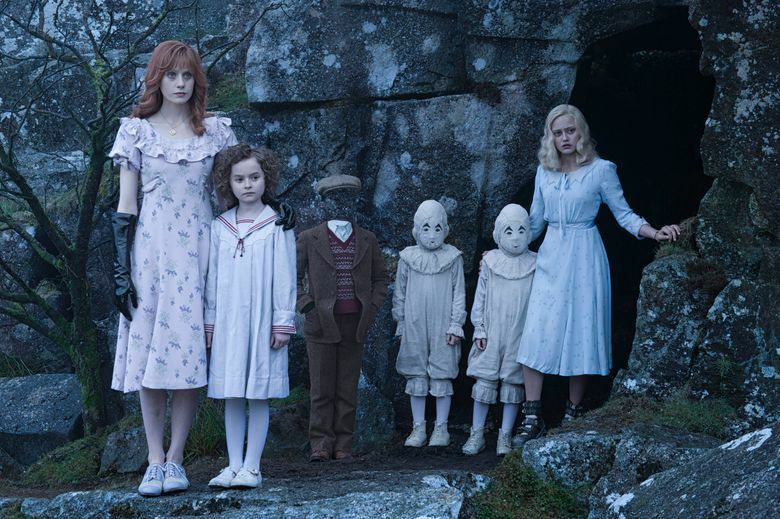 And among Miss Peregrine’s crew is a child who’s so Tim Burton I’d have thought he invented her, though she’s straight out of the book: an angelic-looking little girl whose dainty ringlets conceal a second sharp-fanged mouth on the back of her head. It’s that mixture of weird and sweet that’s Burton’s trademark — and here, for the most part, it works.